I'm a mascara fiend. For sanitary reasons I know one should only have one or at most two mascaras opened at a time. But I probably have 6 (gulp, maybe 7?!?) Then I found this Volumizing beauty at Kmart (truth be told, haven't stepped in a Kmart in years!) for $2.99, how could I resist! I will be repurchasing and using for as long as it available! this stuff is truly amazing and doesn't flake! Ok, it did but by that time is had it on for maybe 8 hours and I was out in the sun. I cannot praise this stuff enough. I'll let the picture do the rest of the talking, this is only two coats! it absolutely does! I've been using this practically every day! Say What!!! I gotta get this. Beats spending $28 bucks for Dior, which I love and will still buy anyways. I gotta try it. And thanks for turning me on to the Benefits "Theyre Real" Mascara. I love it too. For the price I love it! Its a brand we've probably had forever out here and I'm just discovering it! Oww.. that one looks gorgeous, I'm jealous of you, I only have 1 mascara and it's over soon.. Gotta try a new one, which one can you recommedn me appart of this? Hi Flo:) I tend to have several cheap mascaras on hand! My other faves you might like are L'oreal Voluminous carbon black, Covergirl Lash Blast, Covergirl Professional super thick lashes and last but not least Lancôme defencils! Do you have any of those available in Argentina? 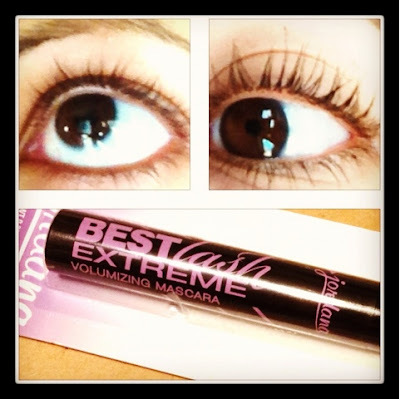 What's your fave mascara? Only L'oreal and Lancome ones, I've just purchased one of Bourjois in Asos.com, hope it works!! L'oreal and Lancome make some of the best mascaras out there. I've never tried Bourjois. Hope it works too!